It's time for another payroll figure already, and if the last one didn't really matter this one feels like it could push the market in either direction. While it's safe to say that the jury is still out on whether the recent dollar strength is just a fad, commodity currencies certainly had a go at trying to strengthen yesterday only to fall back in the final reckoning. The same can be said for the SPX as well. Although GDX did have a nice pop, gold actually closed lower on the day so it's a trifle hard to get too enthused about the rebound. Moreover, the scale of the rally was pretty paltry in comparison to the sell-off of the prior three days, so caution remains warranted at this point. This being said, there are some arguments for this being just a correction in the context of a larger bounce in EM, etc. As a mate pointed out yesterday, while EEM does look like it's rolling over, you can count 5 clear waves off of the January lows. Given that 5 wave moves occur in the direction of the prevailing trend, this would argue that in the bigger picture the rally is still in force and that recent weakness is just a correction. Macro Man isn't convinced, but he's prepared to keep an open mind on this one. Like many people, he is skeptical that the stabilization in Chinese data and the rebound in commodity demand is "real" and enduring. That being said, the currencies of many exporters have been sufficiently beaten up that it does seem reasonable to expect in improvement in fortunes, particularly if demand in developed markets improves due to seasonal or policy-driven factors. As for the US, we're at the point where the market remains priced for very little- Fed funds are pricing in roughly 16 bps of tightening by year end. Bullard has joined Rosengren in musing about the market being underpriced, which is all well and good....but ultimately isn't worth a lick unless some of the influential governors start thinking (and talking) the same way. That being said, there really isn't much more juice to be squeezed out most US fixed income instruments unless you think that QE4/helicopter money is on the way. While it's true that certain prominent holders of hundreds of billions dollars' worth of bonds have expressed these views, we should remember that these holders of several hundred billion dollars of bonds stand to benefit handsomely if these prescriptions come to pass. There remains zero empirical evidence that QE/ZIRP/NIRP is successful in sustainably lifting inflation rates, which would argue against the casual implementation of such policies. As such, if we do start seeing an uptick in activity, at current pricing there is ample room for market yields to rise (assuming Yellen stops braying about the dollar, the rest of the world, etc.) One might credibly assume that such an outcome would continue the trends of the last couple of days. Should the data remain weak, on the other hand, it's a bit tricky to determine whether this would be good for the dollar (on risk aversion) or bad for the dollar (pricing actual easing?) For choice, Macro Man will go with bad for the dollar on tomorrow's number. His NFP model is...gulp....quite bearish, generating a forecast of 79k, its lowest prediction since June 2012. This probably wouldn't bode well for his USD/CAD position, though GDX would presumably do OK. 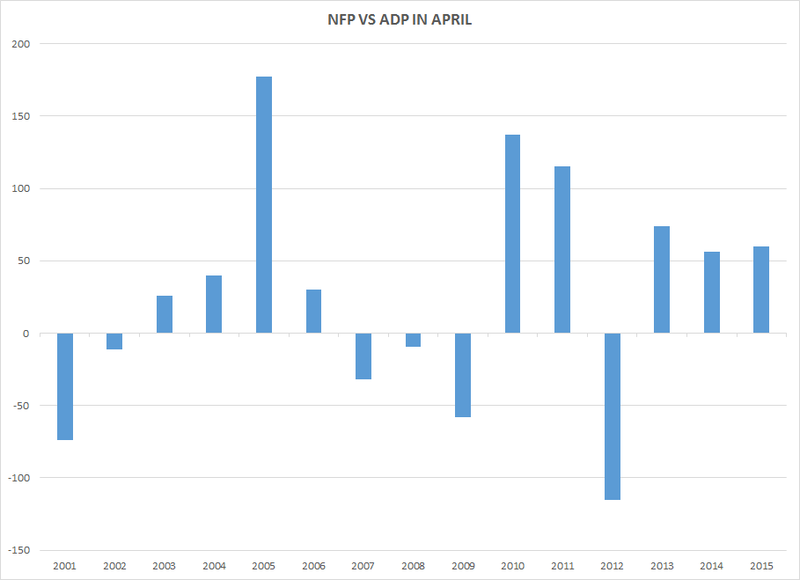 This in turn would argue that Wednesday's ADP figure is consistent with an NFP number of roughly 210k, which is more or less consensus. Still, there are other factors that look less rosy; the Philly Fed employment component registered its lowest reading since the aftermath of the crisis last month. As such, Macro Man is taking the "under" for the third month in a row, and has taken profits on a portion of his USD/CAD as a result. If he gets this one wrong, readers should be encouraged; remember, a 100% reverse indicator is just as good as a 100% accurate one, as long as the hit ratio remains close to 100 (or zero, as it were.) Good luck! Macro man, you since you changed back to a free user comment blog and changed your email address I can only imagined what the market chatter is when related to my market calls. Sweety, where I come from its honour the comments coming from you and your friends in the market place. You keep changing those email address to keep trolls at bay and I'll keep studying the market place for the next negative externalities. The Aussie was absolutely shellacked overnight, which suggests further commodity weakness. Euro is firmer this morning. We are out of EURUSD as of yesterday but still short AUDUSD and long USDCAD. Yes, this is an important number and LB wonders whether the announcement will be made by Ivor Biggun or Tiny Tim. As for market reaction, there are quite a few punters expecting something south of 150k, so even spot on the ADP number of 156k might be a positive surprise! Is 150-200k the Goldilocks zone for equities? As always, it will probably be easier to pick a trade at the end of the day than it is at the beginning, and this week's trends may simply continue once the dust has settled. With MM being on the low side again, we'll take the over, how about a 205k? 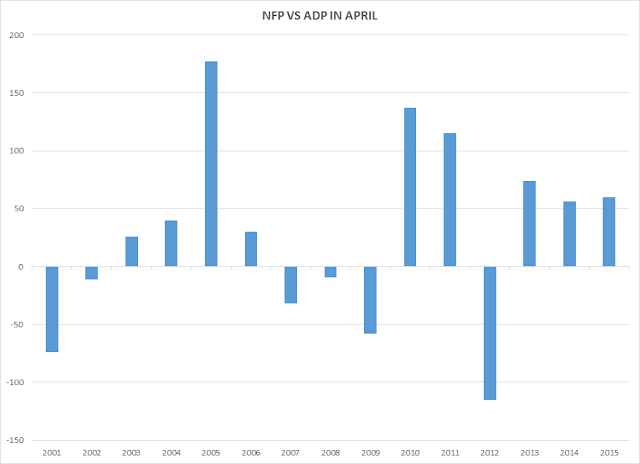 Some observers say Easter disrupts the ADP data and not BLS, and that's why the ADP number is often on the low side in April. We note that J hasn't yet identified this as a FD to B. Expect a rebound in bear baiting here if the market manages to rally today, but we would caution the pre-schoolers that the technical tone of the broad market (look at IWM) has deteriorated. We took most of our IWM short off yesterday, but will likely re-load after a modest bounce in small caps. Fixed income? The charts aren't easy to read, but risk/reward seems to be skewed towards risk after all the weak data and lovey-dovey Fed chatter. We'll leave that one to the aforementioned Billionaires Who Are Long Bonds and Talk Their Book. Enjoy the day, mes petits. No, the AUD was reacting to a very dovish RBA MPS where they ratcheted down inflation forecasts while remaining fairly upbeat on growth. Don't think that tells us anything we didn't know already about commodities. "Fixed income? The charts aren't easy to read, but risk/reward seems to be skewed towards risk after all the weak data and lovey-dovey Fed chatter. We'll leave that one to the aforementioned Billionaires Who Are Long Bonds and Talk Their Book." Agree ... but I would suggest the main risk here is for a strongish number and the likelihood of a little squeeze on the short end. Of course MM's spot forecast is ugly, so let's hope it is wrong ;). Thanks, MM, yes indeed. LB saw that after lifting my head out of my charts. Almost as though RBA sees further China weakness ahead and wants to get ahead of the curve by signaling another rate cut. RBA are actually quite skilled currency manipulators. Dismal weather in NYC this morning - a cold rain that reminds LB of a holiday weekend in Skegness. This is the kind of day where astute Noo Yawkers park on the street and get a free car wash. If I was a long, I'd probably be in a selling mood today, especially in crude .... seriously, we think the set up here is for a bounce in equities, but we retain a bearish bias for the medium term. Look for a return to the airwaves by members of the Hawks and Hikers Club in the next few weeks as US data experiences the usual seasonal pick-up. Agree, CV. A little pop in Fed funds and US2y is likely unless the number is Apocalyptic. Not much interest in NFP Bingo this morning. Come on then, Eyes Down....! LB is usually spot on but I have to agree with MM on this occasion. Aud has been reacting to inflation, RBA minutes, unwind of massive spec long interest and probably giving no useful hints about commodities direction here. I am really tempted to go long aud here for a quick NFP punt but will resist that temptation due to risk of a quick kick in the nuts. I think it could well bounce though because the RBA emission is out of the way and they are unlikely to cut for a while, whilst other indicators are still relatively strong such as employment, retail sales and the real estate market is still buoyant. If this is just a soft patch for the U.S economy and we are in for another round of the market buying into the fed will hike another quarter point then the dollar is a buy here. However, if this is a sustained soft patch that extends into q2 and possibly a recession later in the year then we are in the twilight zone and the dollar is a buy, but not until rate hikes get taken completely off the table. I tend to have a bias to this idea currently and will be watching to see whether today's NFP gives weight to it. Between here and risk aversion, I think it is logical that rate cuts would be priced out and there would be one last leg of a dollar correction. However, if risk aversion cuts in earlier then that could be bypassed. The other meme this taps into is which you think will win the day in the next year - inflation or deflation. With Japanese QE, European QE and previously U.S QE and multiple iterations of Chinese stimulation, the world is still bogged in very low growth and low inflation that seems to be on a further slowing trajectory despite the stimulation. So I tend to think deflation will win out until there is a sufficient crisis that authorities pull out the big bazooka of unsterilized QE. That would fix the inflation problem and probably create an inflation problem with all the excess reserves. Until there is further clarity, I think I will sit on the sidelines. +160k, which probably isn't lower than the whisper numbers. Interestingly, hours worked and wages showed improvement, which suggests that the way this trades on Monday may be a little different from what we see today. Today might be a good day to add to those dollar long positions. 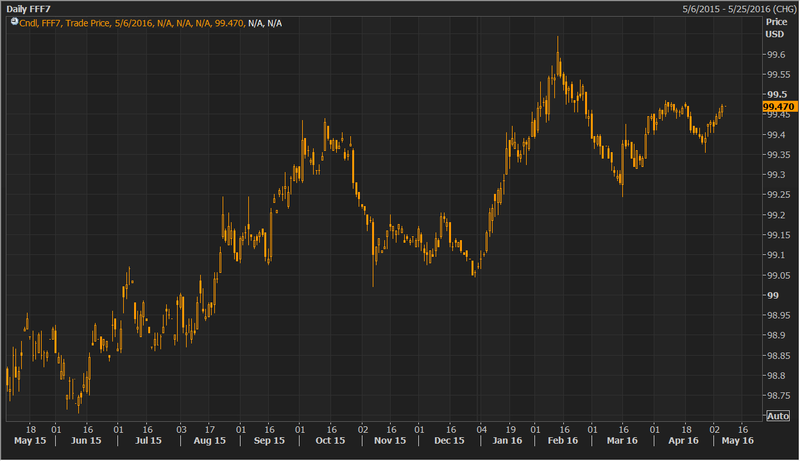 A modest pop in Treasuries may also prove to be a good fade here. 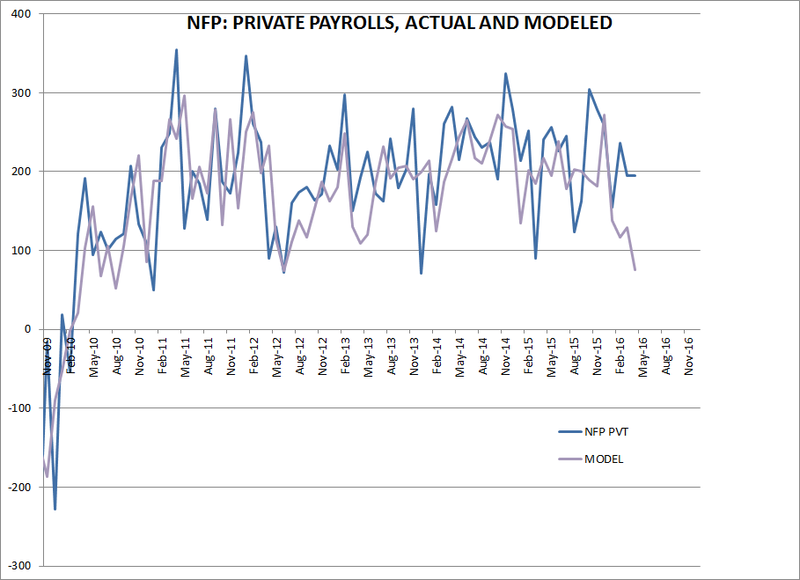 As I predicted a couple of days ago in my rant against the Fed, NFP misses big time. When you have f*ckwits running central banks, expect no less. http://imgur.com/eYZ0WTq my chartology take on EEM. Looking to go back in the range, otherwise a stop around $30. MM, I'm not understanding the CAD logic. if HH was so weak, dont you want to be Long CAD? Market's initial take was that the fig was so bad, it's bad for everyone. Also CAD figure was a little worse than expected. Trading the immediate aftermath of the figure is kind of a sucker's game anyway...hence the emoji. Confused. Big miss on NFP, so USD rallies, then drops back to unchanged? Any thoughts? Anon 1:58 - this is exactly what our models point to, and what I seldom mention here. This is going to be a very unfriendly environment for equities. Looking out to end of this year/early next, inflation will creep up to target in some developed economies, in others slightly over target. Growth dynamics below trend and will continue to taper off. 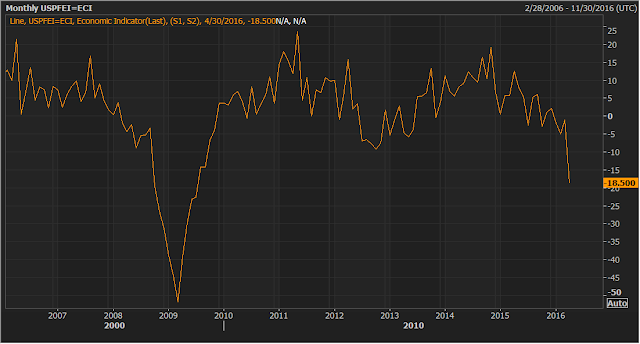 At the same time, long term employment trends are broken in most DM economies, output gap is tighter than most CB inputs (although they are aware of this "in-house") suggest. Stagflation is the name of the game. The jump in wages is really the only saving grace for the hawks in this report. Can't really see how these data move the needle much on anything the Fed will do in June. "I am assuming you are still drunk after yesterday's match..."
Right you are MM; congrats to LB on the EL triumph. Meanwhile, in West London, the only thing my boys are celebrating is that Spurs will NOT win the league. We still have one game left against the dippers, mind, and I really don't want them to do a double on us! @anon 1:58/NRW spot on with the stagflation idea - I've been warming to the theme for the last two years, and my conviction keeps increasing that it is the story for say the next 12-18 months. The more interesting question to me is what comes after - my bet is that since policymakers would take low quality nominal growth over no growth at all, DM's will pivot to fiscal measures with excellent support from the proletariat, which will then lead to some rather painful inflation scares down the road. I am less sure what the means for equities - normally that would be bad, but alas, the general whorishness of the fed/ECB/BoJ leaves me no choice but to consider the possibility that they may, um, 'manage' that outcome. Agree on the longer term pivot to stimulative fiscal policy driven by populist movements, this would go along with tighter monetary policy, and if implemented in the US this would likely be dollar positive, equity and Treasury negative. It would also be a good thing for this corner of the 3rd world with its creaking infrastructure and frankly disgusting income imbalances. For now, we are going to be left meandering for a while here, but only if one assumes that the FED is the only game in town and they are on hold until September (which is not necessarily the case, keep an eye on inflation measures and expectations). However, LB would suggest a few other stories that can impact FX and equities: the general whorishness of the BoJ/ECB, and the China slowdown and/or ongoing credit crunch. Hard to trade EURUSD and USDJPY right here, so we will refrain, but when the growth engine of the world has problems, the appetite for commodities will be curtailed, and reflation trades that have supported the recent rally will reverse, presumably with the usual painful reflexivity we have come to expect. Our eyes will be mainly on crude oil and CAD next week, both of which appear ready to take a bath after recent exuberance. Btw, we closed IWM short and AUDUSD short today and took profits. Not a perfect day by any means, but it was a decent week. Now we get to sit and watch some of the recent moves retrace, one imagines. I'm with you on your central thesis. But I'm holding onto my short IWM, short QQQ and short EEM positions for a bit longer. Although the lowered odds for a rate hike are dollar negative short term, the bigger picture is whether we're in a gentle slowdown or heading toward recession. Without explicitly accommodative fiscal policy and monetary policy, I think we're headed for a solid swoon in the near future. Unlike 2008, where all sorts of interventions were necessary before the election, barring a Lehman like event, I cannot see the Fed jumping in with anything more accommodative this year. Congress will sit on its hands as well. IMHO, 1700 on the S&P is not out of the question. I'm short equities, long bonds and long reits for the moment. Looks v like equity indexes are turning here and heading back up. free time? check out this amazing conference. I'm sure you'll find something you like, investing, technology, health, safety, wellness, sprots. I'll give it to the barbarian at the gate, he puts together a sick conf. Anyone ever gone? reviews? I am not in the "CB always buying" camp. But Trump did say that he is going to "fire" Yellen after her term is up. I am not sure that she would sit still to let a recession happen before the election, which would finish Hilary for sure. I do not have a strong conviction on the US equities in short term. But I think that EM markets will be hit by a big correction. There really is no engine to grow their economies at the moment. And for China, there is additional risk: Taiwan. The new anti-China government will be in place later this month. There seriously should be a risk premium accounting for this development. Regarding Brazil, it seemed to me that its equities and bonds have already priced in the change of its current leaders. Shouldn't we sell the news once Dilma is gone? Last on REITs, based on the great success of Amazon and e-commerce in China, commercial real estate (office and mall) seemed to me is on the path of the long-term decline. Is there a better way to short commercial real estate than to sell certain REIT? I would appreciate your inputs here. Thanks. @abee yes - the predators ball from the 80's sure grew up to be much classier - I remember being there in the early 2000's and noticing a complete lack of surgical enhancements among attendees. And they do make it convenient to access the material, so bless 'em - Macro Man is not the only one dishing out cerebral gems for the poor f@3ks like me operating out of a garage. jbtfd - how high could a bounce from this key technical level take us - think new all time highs or partial retrace? These articles usually appear near the cyclical tops for REITs, which you never hear about when they are battered. NLY has been going parabolic/blowoff in recent days. What many unwary punters fail to realize is this is when the management do the secondary issuance. They raise money at the top, not at the bottom, then stash it away until opportunities arise. 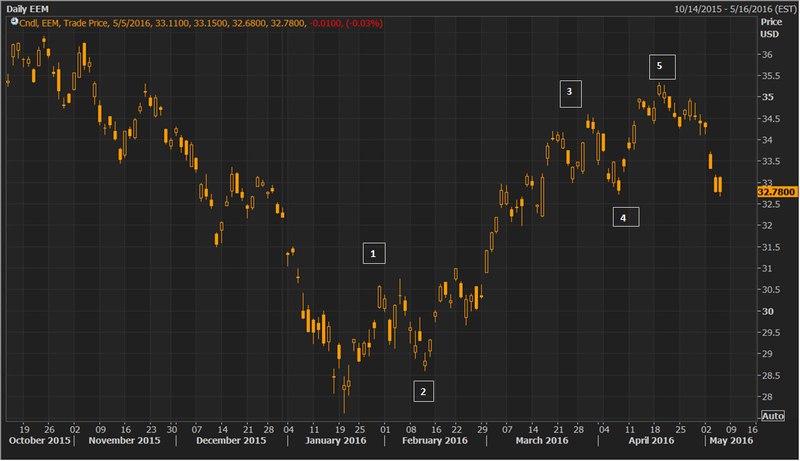 LB is with jbtfd on a little bounce for equities here, for at least a week, perhaps two. We are going to do something dull this week, and just short the long bond into next week's auction. That is our #1 boring week trade, and reflects our short-term outlook. A week where rates and the dollar drift up slowly and crude/CAD drifts down would suit us just fine. Mr Beach, we agree on EMs, commodities etc., but this isn't the time for us to add to our existing positions. We're not in the US recession is imminent camp, so we don't agree on rates, hence on bonds, REITs. Took off +DXY late yesterday, but back in post-NFP. Also, -FFN6 and -FFQ6 post-NFP too. This Fed is hostage to markets and if they want to get a hike done this year, the summer may be their only chance. Starting this fall, you have election uncertainty and a fading impulse from China's credit surge potentially roiling markets. I do wonder whether the Fed can actually talk rate markets up to >50% implied odds by the June meeting, which would seem to be a prerequisite to any hike. The press conference and inclusion of "balanced risks" language could clinch it for July, I figure. Happy for any pushback from readers. NLY has bought back 25 million shares in the last two quarters. Are you suggesting that they will now issue back those shares? On their current CC, they indicated a willingness to continue buybacks should the shares become discounted again. The Dollar index has been range bound since last year between 94-100. It looked like we broke out at the end of April only to see a nice return to the breakout range in the past few days (thank you CAD). As long as the dollar is in the 94-100 range its hard for me to have a clear view on what FX is going to do (and thus almost anything else). Any other views, or guide posts ppl are looking at. Certainly if you dig into the Dollar index members there are better insights. CAD seems to clearly stopped depreciating, even given the recent sharp moves. Yen on the other hand looks like to have embarked on a new trend direction and if looking at the past is any guide, once the yen starts going, it usually follows the direction for a year or more, so we still have some time to go there. Some notable other pairs. MXN looks to have topped but stopped right at 200day. SGD looks a bit like CAD, though i have less conviction in it. well the news flow over the weekend are not so good: Saudi Arabia replacing oil minister, Canada worsening fire, Australia planning new election, China's disappoint import/export data. If USD continues to depreciate next Monday, then I might agree that Dollar index has a lot room to go down at this level.